Particular care should be taken when the pull from fishing gear might have a negative effect on stability, e.g. when nets are hauled by a power block or the trawl catches obstructions on the seabed. 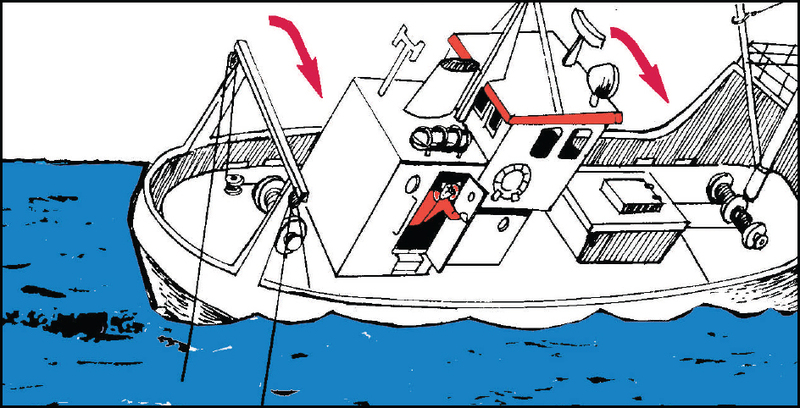 The heeling moment caused by the pull from the fishing gear will cause the vessel to capsize if it is larger than the righting moment (moment of statical stability). For a vessel 10 metres long and 3 metres wide, it only takes a pull of two tons from the fishing gear to cause her to capsize. Bad seastate and vessel hanging fast by its fishing gear.